Before leaving town, we took a walk along the scenic river walk to find and take a picture with the “Bronze Fonz.” The life-size statue pays homage to Arthur “The Fonz” Fonzarelli from the 1970s sitcom “Happy Days,” which was based in Milwaukee. The kids, of course, had no idea who Fonzie is, and were probably wondering why we were taking a photo with the strange, gold-skinned man wearing a black leather jacket. Continuing our exploration of the riverside, we came across a couple giant orange construction cones, which, with us being from Western PA, the kids were much more familiar with. I assume it was just some type of art installation. Either that or WisDOT’s motto is “Go big or go home.” Having had our fill of Milli-wah-kay, we hit the road for Chicago. Hugging the lakeshore, we approached Chi-town from the north, stopping off in Evanston for some deep-dish pizza at the famous Lou Malnati’s. Our good friends George and Joline used to live in Evanston, and tipped us off on where to eat. It didn’t disappoint. Fully satisfied and slightly groggy from the pizza, we continued on toward Chicago, making a quick photo stop at legendary Wrigley Field before reaching the Hotel Indigo Chicago in the city’s Downtown Gold Coast section. Unfortunately it was unseasonably cold — temperatures hovering in the low 60s — and we were fully unprepared, clothes-wise, for the Windy City. But we weren’t about to sit around in the hotel all night, so we dragged the kiddos out into the cold, bribing them by offering to take them to the LEGO Store in Water Tower Place. Then, after not buying them anything (LEGOs aren’t cheap! ), we warmed up at the Dollop Coffee Co. before calling it a night. Thankfully we awoke to a sunny and much warmer day and headed out the door around 9 a.m. to grab some breakfast. Thanks to a tip from a friendly Chicagoan we met in the lobby, we made our way to the Original Pancake House, where the kids had their standard chocolate-chip pancakes, I enjoyed some strawberries-and-whipped-cream-topped French toast, and Cass did her best to eat a football-sized, four-egg Western omelet. Sufficiently fueled and caffeinated, we head out to catch the Big Bus for a hop-on, hop-off tour of the city. Finding our seats on the top level of the red, double-decker bus, we sat back and took in the breathtaking views of this wonderful city. During our tour of New England a couple years back, we made a stop in NYC on our way home and, quite honestly, it was hectic and overwhelming. Chicago was nothing like that. It was much more pleasant and calm, at least what we saw of it. It was more like a big neighborhood than a city, skyscrapers notwithstanding. Best of all, it didn’t smell like a big, rotting dumpster (possibly thanks to the ever-present Chicago breeze). And we really enjoyed experiencing it all from the top of the Big Bus. Personally, I could’ve ridden the bus all day. But being that it was a “hop-on, hop-off” bus, we decided to jump off at Millennium Park to see the Cloud Gate Sculpture, aka, “The Bean.” From there we made our way over to Maggie Daily Park to surprise the kids with the incredible playground there, and along the way discovered the stunning Jay Pritzker Pavilion, where a symphony orchestra was practicing for a classical concert that evening. After that we let the kiddos run around and play on the amazing playground for an hour or so before dragging them away (literally) to go grab some much needed sustenance. On a tip from a friend, we walked about a mile — with me carrying my getting-too-big 9-year-old on my shoulders the whole way — to Portillo’s to have one of their legendary Chicago hotdogs, complete with mustard, relish, celery salt, onions, tomatoes, kosher pickle, and sport peppers on a poppy seed bun. Being from Western PA, I was weaned (or weinied on) chili-and-cheese dogs from the Brighton Hot Dog Shoppe. 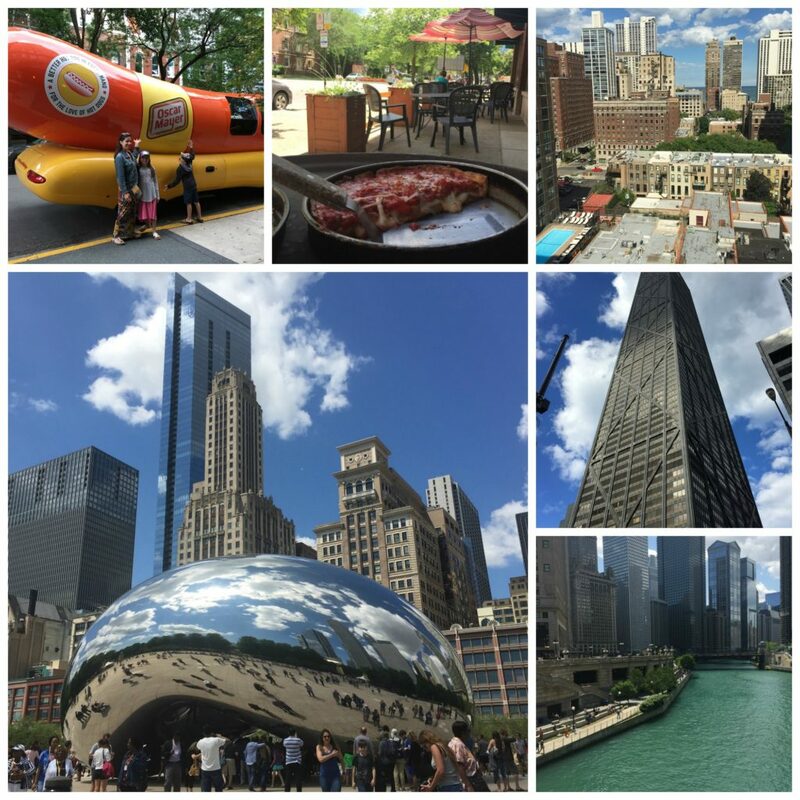 Although I’ll always love my HDS, I have to say that the Chicago dog was a refreshing and delicious change of pace. After lunch we hopped back on the Big Bus and took it to Navy Pier to catch our boat for the architectural river tour, of which we had heard many good things. But somehow we got on the wrong boat, and instead of touring the river we ended up touring windy Chicago Harbor. By this time the sun had fallen behind the buildings and the temperatures had again dropped, so we huddled close together and tried to conserve body heat during the 45-minute tour. Back onshore we corrected the situation and boarded the correct boat for the architecture river tour, where, thankfully, we were able to warm up a bit in the sun, at least when it wasn’t disappearing behind one of the many impressive skyscrapers. 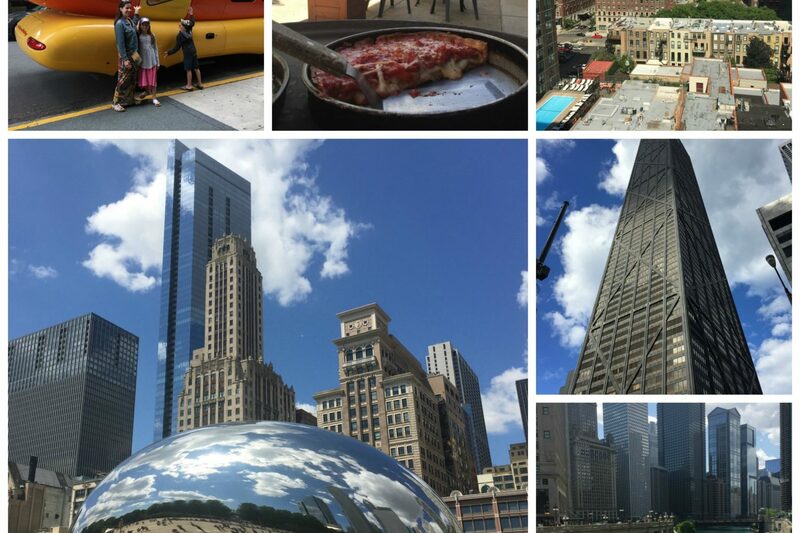 Even though I was trembling by the end of the tour, I was so glad to have experienced the beauty of Chicago from such a unique perspective. Having had our fill of Chi-Town (and desperately wanting to warm up), we headed back to the hotel to dine on leftover deep-dish and have a couple beers (and ice cream for the kiddos) while watching “American Ninja Warriors” in bed. Tomorrow it would be so long to the Windy City and hello to the bucolic backroads of Indiana!